Did an eight year old compete and win a medal at the Olympics? When it comes to tracking down missing biographical details for Olympians who competed over a hundred years ago you might expect the trail to be pretty cold by now – and you’d be right. Without divulging too much of our methods, I’ll just say that it can be done if you’re willing to put in the hard yardage cross referencing known information with newspaper reports, censuses, birth records and even ships’ manifests. The best person I know at this is my Estonian colleague Taavi Kalju and it was while researching some French and Belgian Olympians from the early part of the last century that he found a surprising piece of information. The star of this story is about as obscure an Olympian as you could possibly find, a Belgian coxswain who steered the Royal Club Nautique de Gand (Dutch Koninklijke Roeivereniging Club Gent) rowing eight in the Olympic Games of 1900 and 1908 by the name of Alfred Van Landeghem. Taavi searched the birth registers of Ghent for a possible match and found only one. Now this is where things get interesting because this Alfred Van Landeghem was born on the 26th October 1891 which would make him 8 years and 316 days old when he competed at the Paris Olympic Games of 1900. Not surprisingly that would make him the youngest known Olympian ever and, since his team placed second in the final, the youngest known Olympic medallist ever as well. The 1900 Olympic rowing events were notable for the use of very young coxswain. Some, like the mysterious young French boy picked out of the crowd as a replacement cox for the Dutch pair, have vanished into history without their name or age being recorded for posterity. (There is a name we have seen but we don’t trust it, and won’t even publish it here.) A picture of the late substitute exists which suggests he may be in his early teens or possible as young as 10. So what of Van Landeghem? Was he really an 8-year-old Olympic medallist? 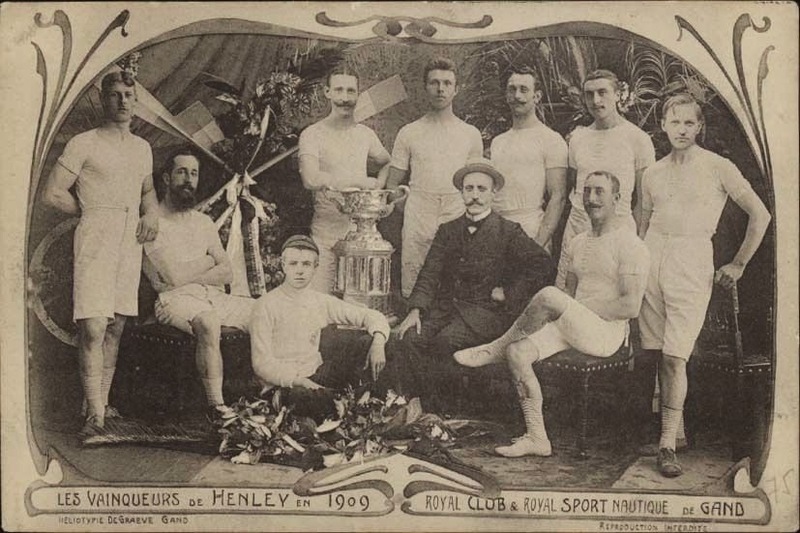 No pictures seem to exist of his Olympic exploits but a postcard was published of the Belgian crew at the 1909 Henley Regatta. Van Landeghem is sitting directly in front of the trophy. The Van Landeghem born in 1891 would be 17 in 1909 and this appears to tally with the appearance of the man in the picture. Van Landeghem was a cox of Royal Club Nautique de Gand from 1900-1903 winning multiple European titles in coxed pairs, fours and eights. In the following years Royal Club Nautique de Gand used other coxes (Raphael Van der Waerden & Rodolphe Colpaert), but in 1908 and1909 again Van Landeghem was against used as cox for his club, including at the 1909 Henley Regatta. Ghent crews were very prominent in European rowing circles in early 1900s, winning multiple European titles and the Henley Regatta Grand Challenge Cup in 1906, 1907 and 1909. Sadly there is a tragic postscript to this story as he died on 19 October 1914, a week shy of his 23rd birthday. It may well be that he was killed in action, as 19 October was the first day of the Battle of Ypres although his name does not appear on the lists of Belgian war dead that we have so far found. We have been in touch with his club who are helping us with our enquiries but, at the moment, all we can say it that seems likely that we have the right man though we don’t have that final piece of conclusive evidence.